Wow -- where to start this week? First of all, it was a WONDERFUL homeschooling week. Everything was relaxed and productive. I bit the bullet and finally jumped out of the traditional math program for my oldest. She has been using Horizons for nearly three years and her mastery level is wonderful, but she just doesn't like math. I really thought about the way MOST people use math and is all of this math in the traditional books very applicable to our lives?? So, on the advice of Tristan (Our Busy Homeschool) I downloaded Charlotte Mason's Business Math Series - Your Pet Store. This is a math curriculum recommended for 8-12 year olds and it is very real world. Basically, this week Miss B opened her own pet shop. What did this encompass? There was quite a bit of math involved (addition, subtraction, multiplication, division, percentages), but it was very enjoyable, and I love that she can see the real life applications of math. Now my six year old wants to open a pet store, too! We are just in the beginning stages of this math, but I recommend it to you if you want a change of pace and some fun. We aren't totally abandoning our math textbook... but we need a break. In the title of the post you noticed "Hurt Feelings". I must say that my mama bear instinct came out in a BIG way this week. Miss B has been friends with a neighbor girls ever since we moved into our subdivision (6 years ago). As the girls have gotten older their interests have changed, but they have constantly remained friends. My daughter's friend goes to a Christian private school. When the girls were playing outside this week I heard my daughter's friend say to her "I'm having a birthday party on Friday, but I didn't invite you because you wouldn't really know how to act around kids that go to school." Ouch. That hurt. Miss B and I talked about it, and (while it didn't surprise her), her feelings were hurt. I have a sneaking suspicion that this statement was probably heard from an adult in her family; what do you think? Miss B had a present for her friend and was excited for her 10th birthday. Yesterday as we were playing outside in the afternoon, all of the party guests began to show up... and from inside our family room last night all you could hear was sounds of screaming and giggles as the girls jumped on the trampoline and played outside. This is not a situation where I will talk to the girl's mother - I am pretty certain it will fall on deaf ears, but it IS a situation where as homeschoolers and Christians we have a chance to let our light shine. (A friend of mine from our co-op offered me that wise advice). Miss B will take her present to her friend this afternoon lovingly and wish her a Happy Birthday. We talked about how many times the Bible says we are to forgive and to always show love to people, but I also explained to my daughter that with this forgiveness should probably come a guarding of her heart as well. I think it might be a while before she wants to play with this friend again, and that's OK with me. Girls of this age can be so vicious and cruel, and it just makes me SAD. We also visited a local nature/wild bird store and spoke with the owner about attracting birds to our yard. 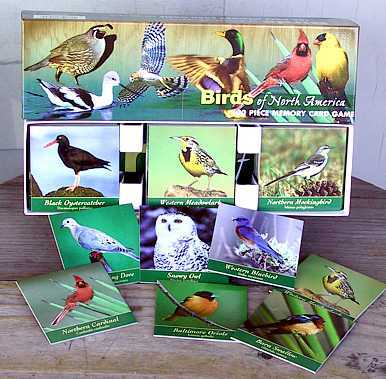 We picked up the GREATEST matching game, with 50 types of birds! The cards are heavy and give the common and scientific names. It also comes with a huge poster. It took us over 30 minutes to play just one game, but the kids played another game without me later in the day, so they were willing to spend the time. Miss B has been particularly interested in horses the past few weeks. She is taking a Horse class at our co-op and is learning about what it takes to purchase and maintain your own horse! She has a friend at our church who is very interested in riding and has her own horse, and last weekend Miss B went to her riding lesson and an eventing competition. At the library we checked out some books about horses (many of them American Girl) and she also downloaded Black Beauty on her Kindle and started reading it this week! Last night we watched Secretariat as well. The whole family is learning about horses now. This is INTEREST LED LEARNING at its best! The heat wave has broken here, so one day we ate our lunch by the lake and continued to read Caddie Woodlawn. It was so peaceful, and we also found lots of bird feathers for our science study! Our history studies have us learning about Julius Caesar now. We just scratched the surface this week with a chapter in Story of The World, and the kids had fun playing "Caesar's Ransom" game from the activity guide. It is similar to Battleship - you hide Caesar (a penny) somewhere on your grid and then the other player guesses where he is. We used marshmallows as markers. We also started reading The Wadjet Eye, which so far is a great book! I know I always say this, but I LOVE Story of the World! While I made lunch one day, the kids went outside together to finish GMan's Lego sticker book he has been avidly working on. I snapped this picture because it symbolizes to me the bond that my children are developing. They truly are each other's best friends, and for this I am so grateful! We also loved getting a new issue of National Geographic Kids. I keep a basket with Highlights, library books, and National Geographics in the car so the kids can read while we are going places. I know I'm missing so much of what went on this week, but what I want to remember most is the peacefulness of the week, and how my children are continuing to let me be their GUIDE and not their TEACHER. I'm happily joining Kris for the Weekly Wrap Up!